(1) The significant fiscal consolidation that has taken place under Greece's structural adjustment program despite low growth and political uncertainty. As a result, Moody's expects that the government will achieve (and possibly outperform) its target of a primary balance in 2013, and record a surplus in 2014 in accordance with the adjustment program. (2) The improvement in Greece's medium-term economic outlook supported by a cyclical recovery in the economy and also the progress made in implementing structural reforms and rebalancing the economy. (3) The significant reduction of the government's interest burden following previous restructurings and official sector repayment assistance. 1. 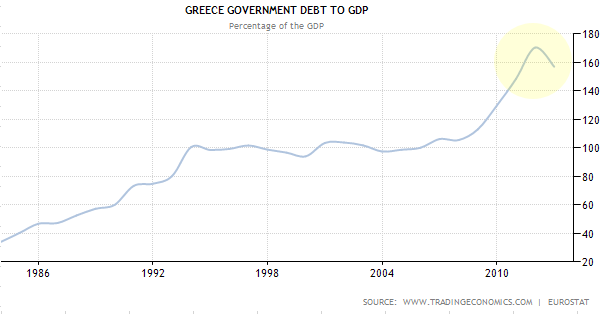 The country's debt to GDP ratio, while still horrible, seems to be moving in the right direction. 2. With the domestic demand in shambles, the nation's current account is in the black. To the extent some of the planned reforms are implemented, the economy could benefit from this trend. 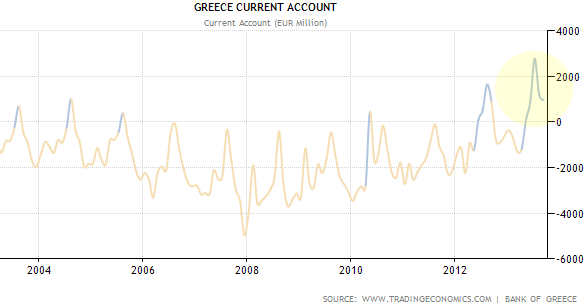 Also as discussed last summer (see post), Greek businesses have been showing surprising optimism. Moody's is hoping that all this will eventually translate into a "cyclical recovery in the economy". 3. As discussed last year (see post), the restructured Greek government debt (including the EU/EFSF loans) carries extraordinarily low interest burden and extended maturities, giving the Greek government a great deal of flexibility. This is Moody's third reason for the rating upgrade. The bond markets have been reflecting these improvements for some time and the upgrade should have relatively little impact on yields. 1. The banking system remains all but frozen, with nonperforming loans, undercapitalization, and poor deposit base hampering credit creation. Achieving a sustainable economic recovery will be extraordinarily difficult unless this issue is addressed. 2. Persistent strength in the euro (in spite of tepid economic data) is believed to be detracting from the overall economic growth across the Eurozone. Strong currency is particularly painful for the more vulnerable nations that depend on exports. Further increases in the value of the euro could make the situation worse.